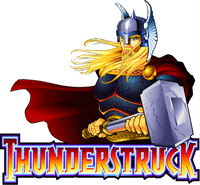 This is a slot by IGT and is quite popular across land-based casino all over Europe. The original only has 3 reels and one payline, in the classic style of early Vegas slots. 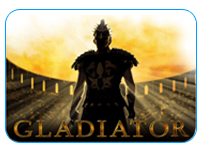 The online version is a 5 reel 10 payline slot (20 paylines in free spins). Currently, there are no Deluxe versions. Click here to play Pharaoh’s Fortune now, or keep reading to find out about Pharaoh’s Fortune ‘s features and payouts . As you can guess by the name, the theme is Ancient Egypt here. The slot mainly features hieroglyphics as symbols. There are also the classic symbols of the Pharaoh and the Scarab. The reels look like papyrus and the design style is quite simple overall. 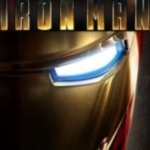 It is a slot which is all about the gameplay, and not about eye-candy design. The interface is intuitive, with every button you need to play placed at the bottom. The paytable button at the bottom shows all possible combinations. Winning combinations in the regular game include, as common, matching 3-5 symbols of the same kind, though matching 2 Pharaoh symbols will also payout. The Pyramid symbol is a wild symbol in the regular game. It substitutes for all other symbols, except for the Golden Scarab (scatter) or the Pharaoh symbols. There are no nudge or hold features for this slot, and the game proceeds as normal without any manipulation from the player. 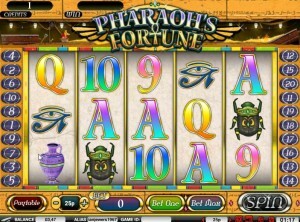 Pharaoh’s Fortune allows for bet-per-line and also allows the player to choose how many lines to run. Maximum bet-per-line is £40, resulting in an overall bet of £400 if the maximum 10 lines are played. Minimum bet for each line is £0.01. Everything is done via the buttons at the bottom of the interface. Players can look at the lines by pressing plus/minus on “lines” at the bottom. 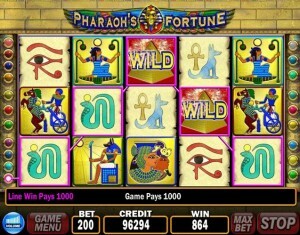 Pharaoh’s Fortune Bonus Feature – three Pharaoh symbols appearing on reels 1,2 and 3 of a played payline trigger the Pharaoh’s Fortune Bonus Feature. The bonus feature wins the player 3 free spins at the minimum, with the option of wining additional free spins and multipliers as explained below. The paytable for free spins is different than that of the regular games, offering slightly lower payouts. The Wild and Scatter symbols are also different during free spins. In addition, the number of possible paylines increases to 20 fixed lined during the free spins. The bet per line is the same as in the regular game. Additional free spins can be won during bonus rounds. The bonus game starts with a free spin bonus multiplier of x1 and 3 free spins and with the opportunity to win additional free spins and multipliers by turning over the stone blocks to reveal either “Free Spins +1”, “Multiplier +1” or “Begin Free Spins Bonus”. Once you reveal the “Begin Free Spins Bonus”, the free spin game will begin. For every free spin, players are awarded a bonus win of 3 x their initiating line bet x the awarded multiplier. So, in effect, every bonus spin is a winning spin! In addition, any free spin winnings are multiplied by the multiplier bonus. This is a great feature of this slot, though it isn’t easy matching three Pharaohs in the first place. The rate of return-to-player is approximately 95.02%, and the maximum jackpot is a whopping £250,000. Good payouts are from matching 5 Fortune symbols (£4000 for £1), the Bird (£100 for £1) and the two figures (£50 for £1). Overall, the free spins rounds make this slot good fun for everyone.